Origin and Habitat: The scattered populations of Agave albopilosa are found in a high altitude area of the nature reserve of La Huasteca in the Sierra Madre Oriental (Mexico). It is highly prized by collectors. Altitude range: 1000 up to 1500 metres above sea level. Habitat and ecology: These small saxicolous agaves grow on exposed areas glued to small fissures in a narrow ribbon of sharp limestone rock that juts straight up out of the earth. Though the natural habitat this species does experience some cool, and foggy days. The populations are formed by scattered solitary individuals or small colonies. 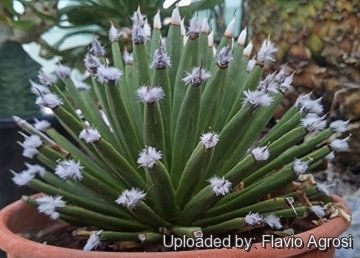 It is associated with Agave bracteosa, Agave lechuguilla, Agave striata, Agave victoriae-reginae, Dasylirion berlandieri, Yucca rostrata, Hesperaloe funifera, Hechtia texensis, Portulaca pilosa, Echinocereus reichenbachii, Mammillaria formosa and Mammillaria prolifera. The achievable plants are severely depleted, however, the plants growing on the steep walls of the cliffs are currently endangered. 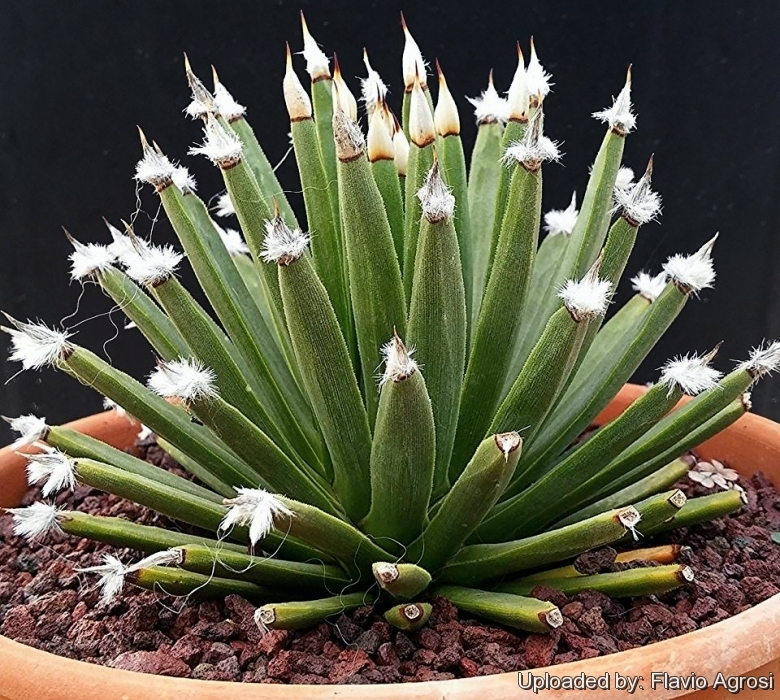 Description: The white hair agave (Agave albopilosa) is an extra small species forming solitary or clustered balls of numerous, narrow leaves. It is unique in the genus and distinguished by the very peculiar full ring of white hairlike fibres just underneath the terminal spine. From a distance it looks like cotton balls on the end of each leaf, however the new leaves do not carry hair, but the horny area around the terminal spine looks a bit like the tip of a triangular wooden pencil that opens like a mesemb capsule to reveal the snow-white fibres. They could act as the areoles in cacti, and may serve as a capacitor and water sensor. For a plant that lives on vertical cliffs, it can be effective. This plant lives in the same manner of a bromeliad Tillandsia. Would it also absorbs moisture through its leaves and absorb water drops through its leaves? It is very slow growing and will grow to around 30 cm in diameter. Three year old seedlings are the size of a tennis ball. The plant was first found in the mid-1990s, but not described and given a scientific name until 2007. Derivation of specific name: The appropriately descriptive name 'albopilosa' is derived from the Latin 'albus,-a,-um' meaning white, and 'pilosus,-a,-um' meaning hairy. This combination refers to the tufts of white fibres at the base of the spine on each leaf. Rosettes: Dense, spherical or hemispherical, to about 15-36 cm high and 25-40 inches across, and are packed with a hundred of leaves. Leaves: Linear to triangular toward tips, variably curved upward, 14-23 cm long, 7.5-12.5 mm wide, medium green to yellow-green, each with a small tuft of white fibres at the base of the short terminal spine. Tufts up to 15 mm in diameter. Margins sawtooth-like with tiny tooth. Terminal spine small, dark grey, brown to black that pokes out beyond the tuft of fibres. Inflorescence (Panicles): 45-120 cm long, unbranched coming late spring, dark purple buds eventually open to reveal greenish purple flowers in the upper half of the flower stalk. Flowers: Bell-shaped, 2-2.5 cm long, 8-10 mm wide. Fruits (Capsules): Elongated, nearly triangular in cross section, 10-12 mm long and 8-10 mm wide. Seeds: Black, 2 mm in diameter. Systematics: It is closely related to Agave striata, however differences in flower and fruit structure are evident. 3) Julia Etter, Martin Kristen “The elusive Agave albopilosa”. In: Cactus & Co. 13(1):44–57; 2009. 6) Etter J. & Kristensen M “Agave albopilosa I. Cabral, Villarreal & A. E. Estrada – Is it really unreachable?” Kaktusy XLVI(2): 58–59. 2010. Cultivation and Propagation: Agave albopilosa requires well-drained soil and light shade to full sun exposure, but prefers some afternoon shade during the hottest summer month to avoid being fried by sun. Growth rate: The growth rate is moderate to slow. Water requirements: It should be kept rather dry in winter or dormant season. To give this marvellous plant vigour and life, water well during spring and summer and let it become barely moist between waterings. Requires good ventilation and avoid over-watering. Exposure: Grow them in partial shade to filtered sun, plants will appreciate a bit of light shade no matter where in the world they are grown. Hardiness. Keep at minimum temperatures above zero in order to obtain good results, but it will tolerate quite low temperatures ( -7 to -8° C), and probably lower if its association with Agave bracteosa and Agave victoriae-reginae is any indication. Along the coast or in areas where there are no frosts, these plants may be cultivated with success outdoors where their beauty is better observed (zones 8b). In cold climates it is advisable to cultivate these plants in pots in order to protect them during the winter in dry, fresh rooms. Because the Plant is so new to horticulture, information on hardiness is scarce. Fertilizer: Feed only twice a year, once in April and once in July with a water-soluble potassium-rich fertilizer. Plant Pests: Prone to mealy bugs and scale. Always inspect any new plant for pests before introducing it to your home or greenhouse. Landscape value. 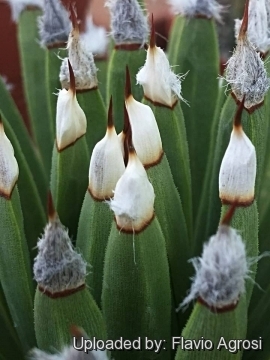 Because of its petite size and interesting tufts of fibre on the leaves, Agave albopilosa makes an excellent container plant that can be grown in all regions. Propagation: It reproduces thanks to the seeds or by the suckers produced occasionally at the base of the stems in the spring. Propagate them in evenly moist soil, mist occasionally and keep in filtered sunlight until they are growing.